I like Penn Jillette, and I'm not one to criticize anyone's accomplishments. Recently, he has been discussing his weight loss in the press, I think for the purposes of promoting his book. My understanding is that his book is about a lot of things, not specifically weight loss, and that his weight loss is only one part of many things contained in the book. But this is not a book review. One thing I read (on Twitter somewhere, I think) was that Jillette lost 105 pounds eating nothing but potatoes. A careful reading of all the press out there reveals that this is probably not true and that Jillette probably never made such a claim. 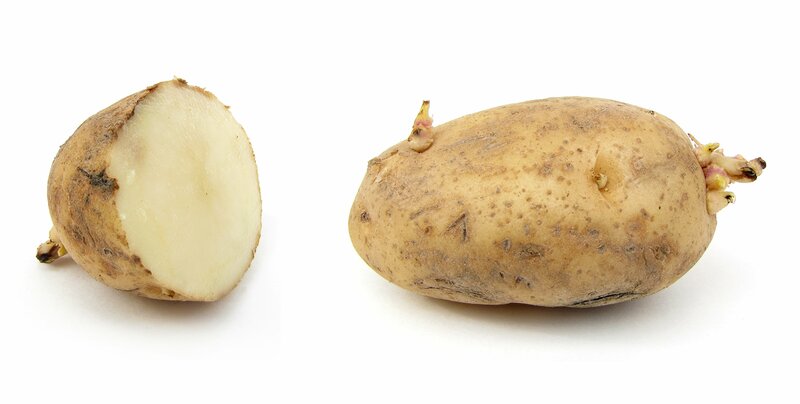 Still, I grew up in the days of the infamous "cabbage soup diet," so I wanted to look into any alleged "potato diet" to see if it had anything in common with the things we've all seen many times before. For those of you who don't remember, or are too young to have encountered it, the "cabbage soup diet" is not so much a diet as it is a process of slow starvation. Cabbage soup is tasty and contains a lot of delicious micronutrients. In fact, I love cabbage soup and I think it ought to be something everyone eats on occasion. But it is not nutrient-dense enough to provide meaningful sustenance no matter how much of it a person eats. That's the "trick" of the diet - you can stuff your stomach full of cabbage soup on a virtually minute-by-minute basis and never consume enough calories to live. Thus, the cabbage soup diet forces a person into severe calorie deprivation until the person loses weight, while making them the hollow offer of "being able to eat as much cabbage soup as you want." One of the links I discovered while doing some light googling was this one, at a website called CalorieLab.com. This particular article appears to be about a year old, so - once again - much of the information about Penn Jillette specifically is speculative and probably resolved by a read-through of Jillette's book. I'm not here to question Jillette, I take him at his word. However, the article has an interesting analysis of calories and rates of weight loss using some offhand Jillette quotes as fodder for the discussion. That, indeed, is valuable. It is not, in fact, a potato diet, but rather some sort of vegetarian diet that kicks itself off with a lot of potatoes. How plausible is it that Jillette lost about a pound a day over three months? The first consideration is that, as he lost weight, the rate of his weight loss would have decreased because his daily calorie needs would decrease with his body weight, assuming his daily food intake during his diet remained constant, at about 1,000 calories per day. Making some ballpark assumptions, let’s say Jillette, as a not-very-active male with painful knees, needs about 15 calories per pound to maintain his weight. So at 330 pounds he needed to eat 5,000 calories per day to remain 330. At 225 he needs to eat about 3,350 calories per day. Since 1 pound of body fat equals about 3,500 calories, daily weight loss at the beginning of the diet (with a 4,000-calorie deficit) would have been 1.1 or 1.2 pounds, dropping to about 0.4 pounds per day at the end (with a 1,350-calorie deficit). So with these assumptions the numbers don’t work out to an average one pound per day. Other factors, such as loss of excess liquid from edema, more activity than we’re assuming here, or an overestimation of daily calories eaten, may account for the difference. CalorieLab says that "the numbers don't quite work out," but even at their slowest estimate - 0.4 pounds of weight loss per day - this is a marvelous accomplishment for anyone. Two months of such weight loss would translate to nearly 25 pounds! The diet analyzed in the course of the article consists of enormous quantities of fruit, vegetables, beans, and rice, but still only about 1,000 calories per day. I'm not an expert in this area, so I can't really say how healthy this is - my suspicion is that it's a lot healthier than being morbidly obese, but not nearly as healthy as a well-balanced 1,800 calorie/day diet coupled with a reasonable fitness regimen. When it comes to weight loss, my theory is whatever actually succeeds in making you want to make the sacrifices required to lose weight is the right solution for you. For some people, that's going to be a radical vegetarian diet, and for other people it's going to be something like a "paleo diet," and for other people it will be some weird nuts-and-seeds diet, and so on. It's nice to get thin and healthy and active, so I try not to judge too much, but still, certain diets are just plain dangerous, such as drug-aided diets and cabbage soup. The benefit of doing the kind of analysis found at the CalorieLab link is that it expresses prospective weight loss in terms people can grapple with. It's not just eating cabbage soup forever until you look like a model, it's an actual expression of what your life will be like as you diet. 1,000 daily calories of vegetable stew and berries isn't a lot of food, and some people won't succeed on a diet like that. But 1,500 calories of vegetables and healthy vegetable fats and proteins is probably easy to manage over the course of a month or two. And so on. The last thing I want to say here is this: Jack Lalanne used to say, "Give me just three days without sweets and it will change your life." His point - and mine here - is that the body will adapt to the kind of diet you feed it. If you eat a lot of sugar, your body learns to like sugar. If you stop eating so much sugar, your body finds pleasure in things like broccoli and cheese. If you eat too much vegetable oil, then toning it down dramatically will result in taste buds that do not require large amounts of added fats to sense pleasure. Ancient Greeks and Romans used to eat curdled animal blood. It was a delicacy. The reason modern people don't eat such things is because we don't have to, but given the right conditions, we would enjoy such things every bit as much as our ancestors did. We can use this fact to our advantage. Following any diet persistently enough will cause your body to start to enjoy, and possibly even prefer, such a diet. When my mother-in-law is in town, our family eats a lot more salt than we otherwise would. Our taste buds adapt, and then when she returns home, we reduce our sodium intake again, and we hardly notice after a while. There's no reason a person can't commit to a short period of very healthy eating and keep it long enough for their body to adapt to it. A few years back, I did this with a pescatarian diet, and now I would rather eat fish than pretty much any other source of protein. It can happen if you try.